I was doing some preliminary googling for Platinum Chef Challenge #7*, and stumbled (no, I don't know how, given the ingredients) across this website with a recipe for pumpkin and goat cheese croquettes with maple mascarpone sauce. I immediately thought about twisting the recipe into risotto balls, since I'd seen them here and had them on my list of things to try. These were amazing! I was a little light on seasoning, so I've increased that in the final recipe here. 1. Bring the chicken stock to a boil, then reduce to a simmer. 2. Heat 1 Tbsp of the butter in a saucepan. Add the minced shallot, cook until tender. Add the pumpkin and sage, stir to combine with the shallot. 3. At this point the butter will be gone, push aside the pumpkin and add a drizzle of oil to the pan. Add the rice, coating it with the oil. Toast the rice, while stirring, about 2 minutes, then combine with the pumpkin/shallot mixture. 4. Add the wine, stirring to combine, cook for 2-3 minutes. 5. Add broth, one ladle at a time, stirring constantly with each addition until broth is absorbed. When finished, the rice should be tender, but firm to the bite. 6. Remove from the heat and stir in the goat cheese and remaining 1 Tbsp of butter. You can save all of it for risotto balls, or reserve 2 cups of risotto and eat the rest. :-) The remainder of the recipe is based on 2 cups of risotto. 1. Combine the risotto, eggs, and 1/2 cup panko. In a separate bowl, combine the 1 cup panko and sage, for rolling. 3. Chill in a refrigerator (I'd say at least an hour, I had them in there for over 2 hours). 4. Heat oil in a sautepan (I just used enough to liberally cover the bottom), and fry risotto balls until golden brown on each side. Be careful not to crowd the pan. Drain on papertowels and sprinkle with salt. *I have it as #7 in my book, and if I make this one #6 I will have two #6s and that bothers me! In college, I minored in Spanish (actually I had 3 minors, but that's another story). I wanted to finish up the minor before my junior year (to work on the other two), and I got the opportunity to study abroad in Spain over the summer to complete that goal. I spent one month there, studying in Salamanca but traveling much more of the country, and it was nothing short of amazing. On one excursion, we traveled to northern Spain, the part that sticks out over Portugal. It was there that I had my first taste of flan. And really, that's all I had - one taste. I didn't like it! Give me pudding - awesome. Give me jello - great. Give me pudding that wants to be jello? No thanks! (I know, pudding and custard aren't even close, but that's what it looks like!) It's definitely a texture thing for me. See more TWD bakers here! Center a rack in the oven and preheat the oven to 350 degrees F. Line a roasting pan or a 9-x-13-inch baking pan with a double thickness of paper towels. Fill a tea kettle with water and put it on to boil; when the water boils, turn off the heat. Put a metal 8-x-2-inch round cake pan-not a nonstick one-in the oven to heat while you prepare the caramel. Stir the sugar, water and lemon juice together in a small heavy-bottomed saucepan. Put the pan over medium-high heat and cook until the sugar becomes an amber-colored caramel, about 5 minutes-remove the pan from the heat at the first whiff of smoke.Remove the cake pan from the oven and, working with oven mitts, pour the caramel into the pan and immediately tilt the pan to spread the caramel evenly over the bottom; set the pan aside. Meanwhile, in a 2-quart glass measuring cup or in a bowl, whisk together the eggs, yolks and sugar. Whisk vigorously for a minute or two, and then stir in the vanilla. Still whisking, drizzle in about one quarter of the hot liquid-this will temper, or warm, the eggs so they won't curdle. Whisking all the while, slowly pour in the remainder of the hot cream and milk. Using a large spoon, skim off the bubbles and foam that you worked up. Put the caramel-lined cake pan in the roasting pan. Pour the custard into the cake pan and slide the setup into the oven. Very carefully pour enough hot water from the kettle into the roasting pan to come halfway up the sides of the cake pan. (Don't worry if this sets the cake pan afloat.) Bake the flan for about 35 minutes, or until the top puffs a bit and is golden here and there. A knife inserted into the center of the flan should come out clean. Tuesdays with... Mint Chocolate Cupcakes? I took one look at this week's Tuesdays with Dorie recipe (Brioche Raisin Snails) and realized that I had enough on my plate this weekend (namely taxes, taxes, and more taxes) so it was a good time to take a week off. I thought, instead, that I would find a simple plain white cupcake recipe with some sort of green filling and frosting to share with friends for St. Patrick's Day. I stumbled upon (hmm, I've been doing a lot of that lately) this recipe for Mint Chocolate Cupcakes. Usually, chocolate doesn't call to me, but MINT chocolate... now we're talkin'! Second batch of 12: I put less in the cups, which seems to help. They were still tough to get out of the pan, as the top was very fragile, almost like a meringue/macaroon. I went back to the website... sure enough, hers were beautifully risen. I started going through the comments and came to find out that at least I'm not the only one! Others had similar issues, so I read through their brainstorming session. ~Oven not the right temperature... well I've gone through great pains to get that right, so that's not it. ~Baking powder too old... if so, there's nothing I can do about that now, so what else is there? ~Cupcakes aren't done... I tested, they were done. ~Don't open the door for at least 15 minutes... OOPS. Since that was really my only saving grace for batch #3, I gave it a shot. Third batch of 12: I was very careful to add just enough batter to the cups (I was using a 1/8 cup measure, about one heaping scoop each). I put them in the oven and didn't even look at them through the window until 25 min later when they were done. They still weren't as pretty as they should be, but at least they'd be presentable to friends. Given the plight I'd just been through, and the fragile nature of the top, I decided to skip the ganache filling (another project for another day). Next task to tackle: Buttercream frosting. Frosting in general is just a bad idea in my kitchen. I never seem to get it right. In the past, I've had problems with funny tasting powdered sugar. So now, any batch of frosting starts with a new bag or box. I decided to make a little less frosting than called for, since I had less cupcakes to frost and didn't plan on using as much as she did. I had just enough to frost 16 cupcakes - perfect for sharing (the remainder are frozen, awaiting some divine inspiration). 5. add one egg at a time, mixing for 30 seconds between each. 6. sift the flour, cocoa powder, baking powder, and a pinch of salt into the mixture and mix until blended. 7. scoop into cupcake cups and bake at 350 F for 25 minutes or until a toothpick comes out clean. 2. heat cream and 1/4 cup mint until bubbles form around the edge of the pan, pour cream through strainer, over the chocolate. 4. add butter and the remaining teaspoon of chopped mint and stir until combined. 5. let cool then transfer to the refrigerator to thicken, 30 minutes to 1 hour. 2. add 4 cups of sifted powdered sugar, milk, and peppermint extract, beat until combined. 3. add more powdered sugar as needed to get piping consistency. Note: I tried to keep the mint flavor subtle and not too overpowering. I recommend starting on the light side with 1/8 teaspoon or less and tasting to get the flavor you want. 3. top with something green (if you want), like a mint leaf, green candy, or whatever you fancy. This is, hands down, the best vanilla ice cream I've ever had! After making the apple pie-cake last week, I was craving some vanilla ice cream. I haven't bought any from the store since breaking out my ice cream maker (gift from the wedding), so I started searching for a low-fat vanilla ice cream. I stumbled upon this during the search, and thought it is by no means low-fat, I decided it was worth a shot. It is definitely a keeper and I can't wait to try some other recipes from this site! **Updated 06/29/08** I have played around with this a bit, to find the right volumes and lower the fat content a bit. This is perfect for a 1.5 quart ice cream maker. Here is the revised version... still great as ever! 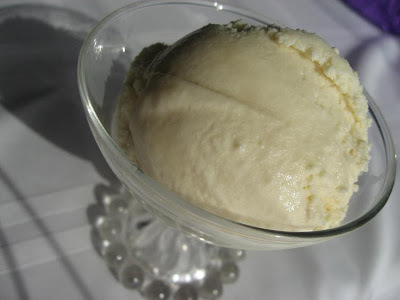 ~In a large mixing bowl whisk together egg beaters and sweetened condensed milk until thoroughly mixed. ~Then add sugars and mix. ~Add heavy whipping cream, half and half, skim milk, salt and vanilla extract. ~For the very best results (who wants anything less? ), let the mix chill in the refrigerator for about four hours which allows the mix to "age" before freezing according to the directions with your ice cream freezer. In the never ending search for new meal options on Fridays during Lent, I was happy to be rummaging through my pantry and stumble upon a box of pearl pasta. This box happened to have a healthy, delicious sounding recipe for spinach soup on the side... so I gave it a shot. I changed it up a tad, and certainly added some more seasoning as I initially found it to be quite bland. My husband loved it, too, so I just made a big batch and will be freezing it for an easy to grab lunch. ~Heat butter in stockpot, add onion and garlic and cook until tender, not brown. ~Add broth, tomatoes bring to a boil. ~Add acini pepe and nutmeg, simmer 5 minutes. ~Add spinach and remaining spices, simmer 5 minutes more, until spinach is wilted down. ~Sprinkle with fresh grated parmesan cheese before serving, if desired. After pouring a bowl for myself, I got 6 servings of nearly 2 cups into containers for the freezer, so I'd say this makes about 7 servings. I almost felt as though I could not participate this week. See, my grandmother (or "Grammy") is famous (ok, legendary) in our family for her apple pie (which I actually just made 2 weeks ago and must remember to photograph so I can share it here). She can't go anywhere without bringing one, and we all fight over it. It just didn't see right making an apple pie (ok, pie-cake) from any other grandmother. But, I joined Tuesdays with Dorie to test out Baking: From My Home to Yours cover to cover, so I embarked upon the pie-cake adventure. I knew in my heart of hearts that I should have applied Grammy's tips and tricks to this recipe, but my sense of “I must follow directions!” got the better of me. To Make The Dough: Working with a stand mixer, preferably fitted with a paddle attachment, or with a hand mixer in a large bowl, beat the butter and sugar together on medium speed until smooth, about 2 minutes. Add the eggs and continue to beat until the mixture is light and fluffy, about 3 minutes more. Reduce the mixer speed to low, add the baking powder and salt and mix just to combine. Add the lemon juice - the dough will probably curdle, but don't worry about it. Still working on low speed, slowly but steadily add 3 1/4 cups of the flour, mixing to incorporate it and scraping down the bowl as needed. The dough is meant to be soft, but if you think it looks more like a batter than a dough at this point, add the extra 1/4 cup flour. (The dough usually needs the extra flour.) When properly combined, the dough should almost clean the sides of the bowl. To Make The Apples: Peel and core the apples and cut into slices about 1/4 inch thick; cut the slices in half crosswise if you want. Toss the slices in a bowl with a little lemon juice - even with the juice, the apples may turn brown, but that's fine - and add the raisins. Mix the sugar and cinnamon together, sprinkle over the apples and stir to coat evenly. Taste an apple and add more sugar, cinnamon, and/or lemon juice if you like. Getting Ready to Bake: Center a rack in the oven and preheat the oven to 375 degrees F. Generously butter a 9x12-inch baking pan (Pyrex is good) and place it on a baking shee tlined with parchment or a silicone mat. I've been flexing my baking wings, so to speak, with the Tuesdays with Dorie group and I thought it was time to try cooking something new. I have always been intrigued (ok not always, really just since that aweful-but-addictive Hell's Kitchen) by risotto and the fear that it is difficult to make (quickly followed by the "oh, but it's really sooooo easy!"). Such things never end up being easy for me, but the arborio rice has been sitting in my cabinet for over a week and is too expensive to let waste away! So, off I went to the Food Network for some inspiration. It didn't take long before I stumbled across Giada's Champagne Risotto. The (now flat) leftover prosecco in my refrigerator had a new purpose! I was VERY excited to make this, and it did NOT disappoint! It came together surprisingly easy, and I am very impressed that I mananged to not screw it up. It was ridiculously good and I can't wait to make risotto again!! Place the slices of prosciutto on a lightly greased baking sheet. Bake until the prosciutto slices are almost completely crisp, about 6 to 8 minutes. The slices will crisp up even more as they cool. Reserve for garnish. In a medium saucepan, bring the chicken stock to a boil. Reduce heat to a simmer. Blanch the asparagus in the chicken stock for 2 minutes. Remove the asparagus with a slotted spoon. Set the asparagus aside and keep the chicken stock at a low simmer. In another medium saucepan, melt 1 tablespoon of the butter. Add the shallot and cook until tender, about 3 minutes. Add the Arborio rice and stir to coat in the butter. Continue toasting the rice, stirring constantly, for about 3 minutes more. Add the Champagne and simmer until the liquid has almost evaporated, about 3 minutes. Add 1/2 cup of the simmering broth and stir until almost completely absorbed, about 2 minutes. Continue cooking the rice, adding the broth 1/2 cup at a time, stirring constantly and allowing each addition of broth to absorb before adding the next, until the rice is tender but still firm to the bite and the mixture is creamy, about 20 minutes total. Remove from the heat. Gently stir in the asparagus, remaining butter, Parmesan, salt, and pepper. Spoon the risotto into serving dishes and garnish by breaking the crisp prosciutto into smaller pieces over the top of the risotto. Serve immediately. Another Tuesday, another recipe from Dorie Greenspan's Baking: From My Home to Yours. For this week, Erin of Dinner and Dessert chose Snickery Squares, which are roughly a homemade version of snickers. I was once again concerned about my abilities and having the recipe come out right. For the base, it says to use a food processor for blending the ingredients together. I don't have one, but I do have a mini processor-like attachment for our blender. I had to make the base in two batches so it would fit in the mini processor. I was feelin' good with my new found skills from everyone's biscuit experience. I grated my cold butter like a pro. But I was unsure about the base as I was patting it in to the pan... pricking it with a fork didn't leave nice marks as I expected, but rather, simply dislodged the mixture at that spot. I left it in the oven a little longer than stated after realizing my oven was at about 320 instead of 350. Caramelizing the peanuts (another first!) went surprisingly well, and Dorie's description of the process guided me right through. I have no idea, however, how she fit 1 1/2 cups of nuts in this 8x8 pan. I put a little more than half in the filling layer, then generously coated the top chocolate layer. I had at least 1/3 cup leftover! Clearly there is also some magic to cutting these. My chocolate layer was cracking all over the place. Sadly, I did not care very much for these. I don't know if it is my "eh" feelings on chocolate, or I over roasted the peanuts, or what. They just didn't do anything for me. A few chocoholic friends thought they were great, though! Toss the flour, sugar, powdered sugar and salt into a food processor and pulse a few times to combine. 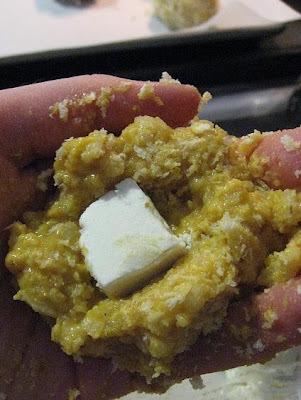 Toss in the pieces of cold butter and pulse about 12 times, until the mixture looks like coarse meal. Pour the yolk over the ingredients and pulse until the dough forms clumps and curds-stop before the dough comes together in a ball. Turn the dough into the buttered pan and gently press it evenly across the bottom of the pan. Prick the dough with a fork and slide the sheet into the oven. Bake the crust for 15-20 minutes, or until it takes on just a little color around the edges. Transfer the pan to a rack and cool to room temperature before filling. Have a parchment or silicone mat-lined baking sheet at the ready, as well as a long-handled wooden spoon and a medium heavy bottomed saucepan. Put the sugar and water in the saucepan and cook over medium-high heat, stirring, until the sugar dissolves. Keeping the heat fairly high, continue to cook the sugar, without stirring, until it just starts to color. Toss the peanuts and immediately start stirring. Keep stirring, to coat the peanuts with sugar. Within a few minutes, they will be covered with sugar and turn white—keep stirring until the sugar turns back into caramel. When the peanuts are coated with a nice deep amber caramel, remove the pan from the heat and turn the nuts out onto the baking sheet., using the wooden spoon to spread them out as best you can. Cool the nuts to room temperature. When they are cool enough to handle, separate the nuts or break them into small pieces. Divide the nuts in half. Keep half of the nuts whole or in biggish pieces for the filling, and finely chop the other half for the topping. Spread the dulce de leche over the shortbread base and sprinkle over the whole candied nuts. Melt the chocolate in a heatproof bowl set over a saucepan of barely simmering water. Remove chocolate from the heat and gently stir in the butter, stirring until it is fully blended into the chocolate. Pour the chocolate over the dulce de leche, smoothing it with a long metal icing spatula, then sprinkle over the rest of the peanuts. Slide the pan into the fridge to set the topping, about 20 minutes; if you’d like to serve the squares cold, keep them refrigerated for at least 3 hours before cutting. Cut into 16 bars. Elly over at ellysaysopa came up with a GREAT new blogging event! 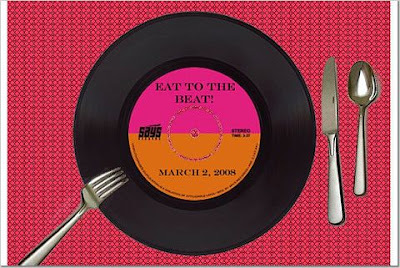 Eat to the Beat challenges it's participants to make something that links to a song, lyrics, band name, etc. I love music and the first thing I thought of was "Strawberry Wine" by Deana Carter. This was actually one of the first country music songs I liked, and lead to an intense love affair with country music. I started with, well, strawberries and wine (of the Italian sparkling sort), and made a Strawberry Bellini and Strawberry "Champagne" Truffles. I have always used Alton Brown's chocolate truffle recipe for truffles, omitting the brandy and changing the flavor by using different extracts. Recently I started using molds to make them, instead of the traditional rolling into balls and coating. I think that worked best for this recipe, because the ganache center is thinner than usual. I cut down the recipe for testing, so I am going to try to scale it back up to the original amounts and include my adjustments. ~Heat the 8 ounces of chopped chocolate in a heat safe mixing bowl. Heat in the microwave in 30 second increment on low power until melted, stirring inbetween. Coat the inside of the molds with a thin layer of chocolate. Set aside the remaining chocolate. Place the molds in the refrigerator to set the chocolate. ~Place the 10 ounces of chocolate and butter in a medium size glass mixing bowl. Microwave for 30 seconds. Remove and stir, and repeat this process 1 more time. Set aside. ~Blend together the strawberries and liqour, then combine with the prosecco. Heat over medium heat in a small sauce pan until reduced by half. ~Heat the heavy cream and corn syrup in a small saucepan over medium heat until simmering. Remove from the heat and pour the mixture over the melted chocolate mixture; let stand for 2 minutes. Using a rubber spatula, stir gently, starting in the middle of bowl and working in concentric circles until all chocolate is melted and mixture is smooth and creamy. Strain the strawberry reduction into the chocolate and stir gently until combined. ~If necessary, re-melt the chocolate by heating for a few seconds at low power in the microwave. Fill the remaining space in the molds with chocolate. Place in the refrigerator to set. ~When the chocolate is completely set, unmold the truffles. Enjoy! These have a luscious creamy center with a hint of strawberry and wonderful rich chocolate to complement it.